(CNN) -- A huge oil spill oozing toward the Gulf Coast on Thursday threatens hundreds of species of wildlife, some in their prime breeding season, environmental organizations said. The Coast Guard said Wednesday that the amount of oil spilling from an underwater well after an oil rig explosion last week has increased to as many as 5,000 barrels of oil a day, or 210,000 gallons, five times more than what was originally believed. Although efforts to minimize the damage are under way and options under consideration include asking the U.S. military for assistance, wildlife conservation groups say the oil could pose a "growing environmental disaster." "The terrible loss of 11 workers (unaccounted for after the rig explosion) may be just the beginning of this tragedy as the oil slick spreads toward sensitive coastal areas vital to birds and marine life and to all the communities that depend on them," said Melanie Driscoll, director of bird conservation for the Louisiana Coastal Initiative, in a statement. Coastal areas of Louisiana, Mississippi, Alabama and Florida could be at risk, the organization said. "For birds, the timing could not be worse; they are breeding, nesting and especially vulnerable in many of the places where the oil could come ashore," she said. "The efforts to stop the oil before it reaches shore are heroic, but may not be enough. We have to hope for the best, but prepare for the worst, including a true catastrophe for birds." "The best case is, the wind shifts and the oil doesn't hit," said Tom MacKenzie of the U.S. Fish and Wildlife Service. "I'm not real confident about that. ... We're doing everything we can to prevent it, but it could be a bad one." It's not just birds that could be affected, although they are usually the first to feel the effects, said Gregory Bossart, chief veterinary officer for the Georgia Aquarium in Atlanta. The birds are right at the surface, get covered in the oil and swallow it, causing liver and kidney problems. "They need to be rescued and cleaned," he said. But the coastline of Louisiana, with its barrier islands and estuaries, "is a very unique ecosystem. It's very complex," Bossart said. Plankton found in the estuaries nourish organisms all the way up the food chain. Crabs, mussels, oysters and shrimp feed on the plankton, he said. Oil smothers the plankton, meaning they cannot eat. Also, "the estuaries here are a nursery ground, literally a nursery ground, for the entire fish population in this area," Bossart said. River otters in the region eat mussels and other animals. And "we know, in this area right now, that there are sperm whales. There are dolphins right in the oil slick," he said. If an oil spill is small enough, animals can leave the area. "Some of them can get away," Bossart said. "It's totally dependent on the size of the slick, and this is huge." Exposure to the oil for a prolonged period of time can result in a toxic effect on the skin, and mammals can suffer lung damage or death after breathing it in, Bossart said. "When the oil starts to settle, it'll smother the oyster beds. It'll kill the oysters," he said. The Audubon Society, which is affiliated with the Louisiana Coastal Initiative, is recruiting volunteers in Florida and making its Center for Birds of Prey available for bird cleansing and rehabilitation. Elsewhere, Audubon said it was gearing up to mobilize volunteers and provide assistance as the oil reaches land. The spill also threatens the Louisiana and Mississippi fishing industry, as crab, oysters and shrimp along the coast could be affected, along with numerous species of fish. Gulf shrimp are in their spawning season. More than 400 species are threatened by the spill, the New Orleans Times-Picayune reported Thursday, citing the Louisiana Department of Wildlife and Fisheries. "When you stop and begin considering everything that this could impact, it really is stunning," Karen Foote, biologist administrator with the department, told the newspaper. iReport: How is the oil spill affecting you? A handful of "Important Bird Areas" -- designated because of their value to bird species -- face immediate threat from the oil, the initiative said. They include the Chandeleur Islands and Gulf Islands National Seashore areas in Louisiana and Mississippi, along with the Active Delta area in Louisiana, which includes Delta Island National Wildlife Refuge and the Pass-a-Loutre Wildlife Management Area. Several species of birds are cause for special concern, the Louisiana Coastal Initiative said. They include the brown pelican, the state bird of Louisiana, which nests on barrier islands and feeds near shore. The brown pelican's breeding season just began, according to the Initiative, and "many pairs are already incubating eggs." The species was taken off the federal endangered species list last year, but "their relatively low reproductive rate means any disruption to their breeding cycle could have serious effects on the population." More than 800 brown pelicans died when a smaller oil spill hit Louisiana's Breton Island National Wildlife Refuge a few years ago, MacKenzie said. Species of beach-nesting terns and gulls, beach-nesting shorebirds, large wading birds, marsh birds and ocean-dwelling birds are also at risk, along with migratory shorebirds and songbirds, the Initiative said. The migratory songbirds move across the Gulf during a two-week period from late April to early May, for instance. "The journey across 500 miles of open water strains their endurance to its limits," the Initiative said. "They depend on clear skies and healthy habitats on both sides of the Gulf in order to survive the journey." According to a 1998 study by Louisiana State University, more than 500 million birds fly over the Gulf and enter the United States along coastal areas in Louisiana and Texas each spring. The barrier islands east of Louisiana's Lake Pontchartrain have still not recovered from the blow dealt by Hurricane Katrina in 2005, Bossart said, and a spill such as this one could seriously threaten their recovery. "I think at this point it would be wrong to say it's catastrophic, because it really hasn't hit any area except out in the Gulf proper," he said. But "it's certainly a very serious thing" that could pose a long-term environmental challenge. 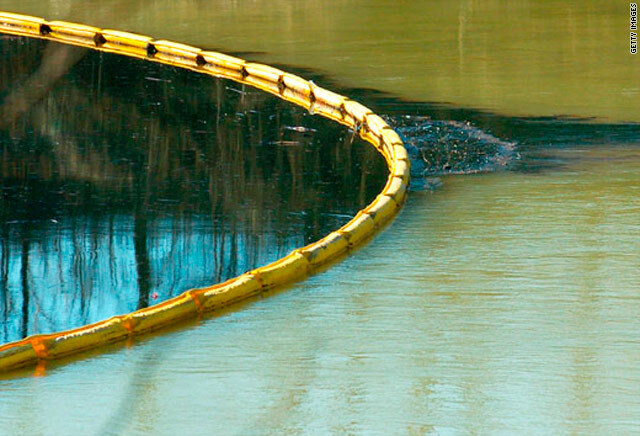 Plans have been under way to protect wildlife since the spill was discovered, MacKenzie said. "We know what we're doing to try to protect those key assets. ... A lot of people are leaning forward in the foxhole to address this."